Monarch Air Group offers a wide variety of private jet charter options to and from Jordan. Our clients benefit from top-notch service, unrelenting dedication to safety, wide selection of aircraft, and years of experience in chartering private jets. To obtain a free quote, please use our online quoting tool provided below, or call toll free 1-877-281-3051. Situated at the crossroads of Africa, Asia, and Europe, Jordan is an Arab kingdom with its capital Amman being the country’s most populous city and cultural and economic center. According to the World Economic Forum’s Index of Economic Competitiveness, Jordan has the 35th best infrastructure in the world. 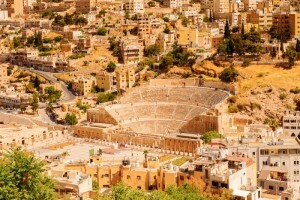 Jordan boasts around 100,000 archaeological and tourist attractions, including famous Petra, Jerash, and Ajlun Castle. The shores of Aqaba and the Dead Sea draw millions of tourists from all over the world, especially from Arab and European countries. Valleys in different parts of the country, such as Wadi Mujib, attract adventurers and hikers as well. Jordan is the also among the best medical tourism destinations in the world. Jordan is home to three commercial airports: Queen Alia International Airport (AMM), King Hussein International Airport (AQJ), and Amman Civil Airport (ADJ), offering international and charter flights. Our operators are standing by 24/7 to assist you in scheduling your next luxury air charter to Jordan. Call us today for a free quote.